NOTE: This guest post was written by Gabriela Taveras. 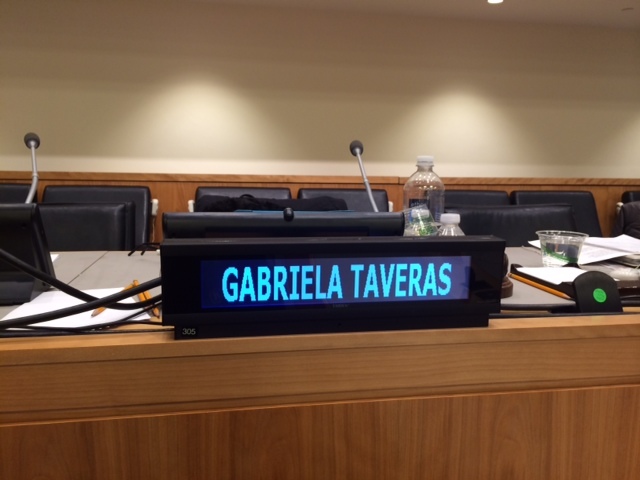 Gabriela is a sophomore student at the School of Diplomacy and International Relations. She currently serves as a School of Diplomacy Youth Representative to the United Nations and as a Representative for the United Nations Association of the Dominican Republic in New York and the Dominican capital, Santo Domingo. In the Seton Hall community, she serves as President of the UNA-USA Campus Chapter. The Dominican Republic is her homeland, and her particular areas of interest include International Development and Peace & Conflict Resolution, which she hopes to pursue through future graduate studies. Dreams are such a curious thing: once they actually become true, we can hardly fathom that they have ceased to exist; twice already have I experienced this in the course of the ongoing semester, and I still cannot believe how fortunate and blessed I am. Since age 12, since the innocent age where I discovered the wonderful world of Model United Nations, I dreamt of speaking at the United Nations. After each invigorating simulation of what the real international organization does, I found myself yearning for a day where the words I uttered with such passion would reach the hearts and minds of people at the UN itself, a day where this form of make-believe would become a part of the real world. Little did I know, that eight years later I would find myself on the other side of the panel. 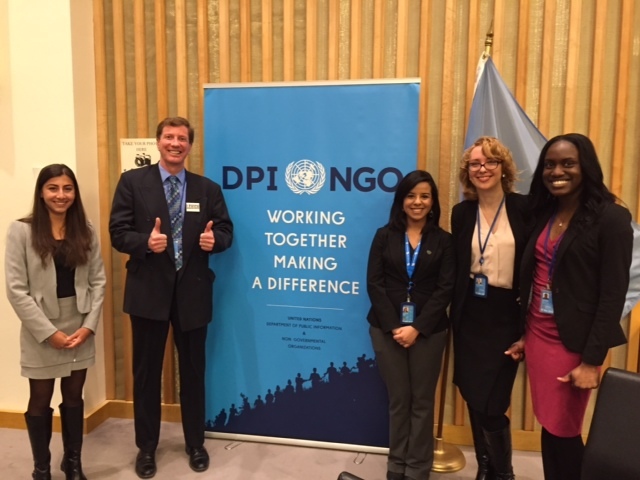 One fateful day at the beginning of February, I was contacted by one of the School of Diplomacy’s Deans, Dr. Courtney Smith, about the possibility of presenting a panel at the United Nations alongside other actively engaged Youth Representatives. To my surprise and honor, he had spoken with my boss, Mr. Emil Chireno, from the United Nations Association of the Dominican Republic (UNA-DR), about nominating me to be a speaker and representative on behalf of both institutions at this prestigious panel. The positive answer this proposal elicited from me has been one of the quickest I have ever given to anything in my entire life. Weeks became days, and as these days trickled into minutes, I found myself basking in a mixture of nervousness and excitement, wondering how many people would be in attendance, how much time I would have to speak, how would others react to my words; I was, after all, a 20 year-old speaking in front of an audience where there would be possibly dozens of adults in attendance. Little did I know exactly how much of an impact my words had during those seven minutes I was permitted to speak. On Thursday, February 26, my fellow panelists, moderator and myself graced an audience of more than 300 attendees with our experiential knowledge and compromised advocacy in the U.N’s Conference Room 3. As my eyes glazed over the crowd, fingers twiddling together as I awaited my turn, I joyfully noticed a wide demographic of individuals in attendance: young and old, from varied cultural and ethnical backgrounds, students and professionals alike. Before I even knew it, our fantastic moderator Dr. Bill Hunter called my name and said it was my turn to begin. I quickly channeled all of my public speaking experience from my several years of Model UN, and the show began. I confidently engaged the public, commented on the slides and facilitated as much information as I could. Before that day, I never realized exactly how limited seven minutes could be! It was quite the change for someone who had been used to giving speeches in the span of a minute and a half. Once my presentation ended, the support others showed through their vigorous clapping and genuine smiles was almost too much to bear; did I truly achieve it? This lifelong dream I had of empowering others and conveying my message straight to their hearts? The enthusiastic and challenging questions, the words of praise and, ultimately, the fantastic individuals I met before and after the panel confirmed it: I had finally achieved my dream, and this was just the beginning of a beautiful journey that would last a lifetime.